Pau Soriano and Lilet Mabbayad debuted for Customs on Monday. 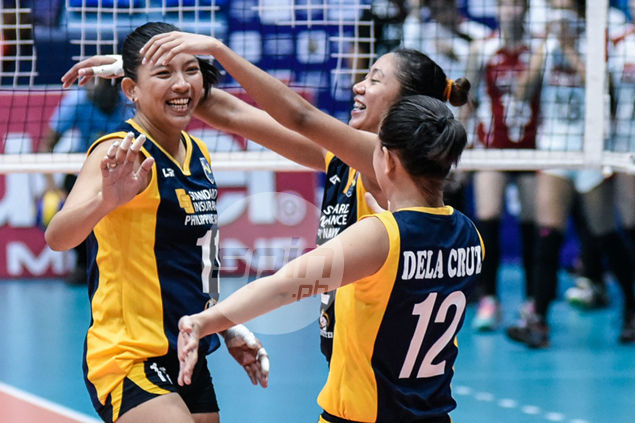 BUREAU of Customs players Pau Soriano and Lilet Mabbayad were meted with sanctions by both the Philippine Super Liga and Philippine Navy after their debut in the Shakey’s V-League Reinforced Conference. Soriano and Mabbayad, who both played for club team Standard Insurance Navy in the PSL All Filipino Conference this year, were banned for one year by the PSL and fined P50,000 after seeing action for BoC in its maiden match in the pioneering V-League against University of the Philippines on Monday at the PhilSports Arena. PSL president Tats Suzara claimed both are under contract with the PSL until the end of the year. “Philippine Navy Standard Insurance still holds an existing agreement with PSL, disallowing players to participate in other leagues until December 31, 2016. Since Pau Soriano and Lilet Mabbayad have been reported to play for V-League tonight, they shall be penalized with P50,000 each and will face a one-year suspension from the PSL,” PSL president Tats Suzara said in a statement. “I’m very sorry matigas ulo nung dalawa. I gave specific instructions for them not to play. They shall be sanctioned and it's unfortunate that Navy will have to reflect them AWOL,” said Col. Joseph Cuison of the Philippine Navy. As per PSL policy, players under contract are not allowed to play in any other tournament outside the PSL.